Mayor Bloomberg at a "Dead End"
As we watch Mayor Michael Bloomberg unfold his intricately orchestrated master plan to maintain his reign of power, there are more than a few reasons why New York will be quite fine – thank you very much – without our billionaire Mayor. You know, the one who seems to think we can’t manage without him, utilizing fear to push his agenda. Mayor Mike got rid of the one guy who could match him in ad spending (see Ronald Lauder, former ambassador to Austria – who knew? – and Estee Lauder cosmetic empire heir) instructing him not to cause a fuss or he’d be ousted from their exclusive social and business circles — despite term limits being this billionaire’s issue for at least 15 years. The City’s other billionaires, CEOs and corporate executives are advocating right and left for their friend Bloomie to linger at City Hall, no matter what it takes. Who cares if it’s a power grab, illegal and anti-democratic? Bloomberg figures he can listen to the people whine for a little while, ride that wave, and then buy them off with another $100 million worth of advertising. Memo to Mayor Mike: I think you may at last have overreached. As these changes go on around them, long-time landlords with long-time small business tenants start to raise rents, doubling, tripling the figures and those tenants are soon gone and replaced. As if they’re expendable. As if they never existed. The fabric of one too many neighborhoods is frayed, coming apart at the seams. Yet, this is the climate Mayor Bloomberg’s New York promotes and encourages. The fact is – it’s no coincidence that the city is vanishing at such a quick pace. While there’s no real funding for schools or libraries or park maintenance in our neighborhoods, there is always money for Wall Street and developers and corporate executives. Since the media rarely reports on this and, if they do, avoids linking this to Mayor Bloomberg and his policies, the public remains largely unaware. The blanding of our city continues on, in neighborhood after neighborhood, public space after public space, to create the bland yet affluent City that Mayor Bloomberg, a billionaire, envisions. It’s a less interesting one but the billionaires and their friends are happy. That’s what matters, right? No. It’s time for the city to catch its breath. To attempt to make up for this blatant, expanded, accelerated loss of its character over seven years. As we’ve seen, what works for Wall Street and Corporate America doesn’t really work for the rest of us. They want to maintain a certain lifestyle and will do whatever it takes to do so. 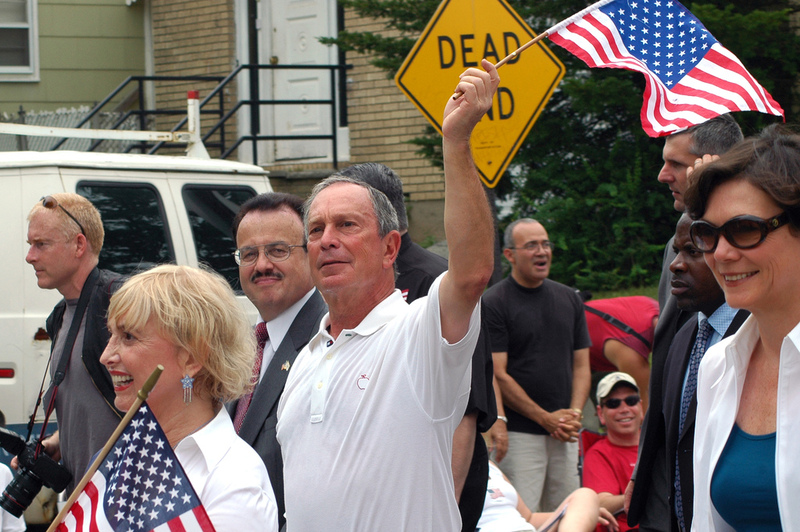 Michael Bloomberg’s decision to stay on as Mayor of New York City in defiance of democracy has nothing to do with New York City and everything to do with Michael Bloomberg and his ego. It is time for Mayor Mike to go. Rally. City Hall Steps. This Sunday 10/5. Noon. And… 2 p.m.